Casa Alba, established in 1998, was one of the first B&B to open in the town of Lucca. The owner, Alba Pracchia, returned to her home town after living for several years in Holland and Australia. She then decided to transform her apartment into a B&B in order to keep her passion for foreign languages and cultures. 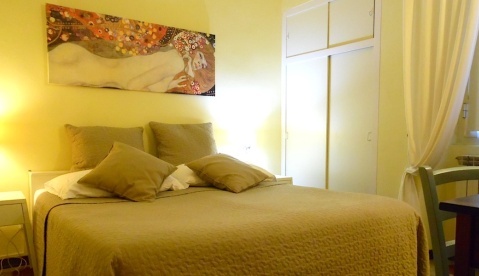 Casa Alba, situated right in the heart of the city, on Via Fillungo, offers a wonderful location for it’s guests. Via Fillungo is a major pedestrian street with beautiful shops and bars. You can walk anywhere in a few minutes. You can visit museums and historical monuments, restaurants and the lovely promenade on top of the city walls. The beautiful church of S. Frediano and Piazza dell’Anfiteatro are just around the corner. Piazza S. Maria, only 200m away from Casa Alba, is where you can find a tourist information centre, banks, and bicycle rentals. A bicycle is a wonderful way to discover Lucca. It is a wonderful experience to ride through the medieval streets, or along the river Serchio into the beautiful country side very near the city. The rooms at Casa Alba are bright and confortable, 3 of the rooms have ensuite facilities, and 1 room has aprivate external bathroom. In each room there are amenities such as hairdryer, AIRCO, Sat TV and fast wifi connection, at free cost. Breakfast is served between 8.00 and 10.00 am, in a lovely breakfast room, offering a choice of coffé or tea, also green and herbal, milk, orangejuice, muesli, cornflakes, fresh bread, jam, ham , cheese, honey and a selection of fresh seasonal fruits. The electric kettle provides hot water for tea and instant coffee at all times, so that a guest can make coffee or tea on their own, anytime. Our guests are provided with their own keys so that they can come and go at anytime they choose. Alba and Giuseppe will be happy to answer your questions about parking, booking a restaurant, or getting a taxi. A previous contact by mail or phone is need it, to organise your check in at Casa Alba. We don’t have an elevator, but we help our guests with their luggage up the stairs to their rooms. Driving a car is restricted in Lucca centre. Via e- mail we can issue a temporary permit so you can drive your car to Casa Alba to unload your luggage. We can direct you to where parking is permitted.